9th Azerbaijan International Career Exhibition, a unique specialized platform providing opportunities such as direct employment and gaining the experience of holding professional dialogues with specialists in recruitment, will take place on the 9th-11th of October at the Baku Expo Center. The importance of this event is highlighted by the fact that the exhibition is supported by the Ministry of Education of the Republic of Azerbaijan. The exhibition is organised by Caspian Event Organisers (CEO). 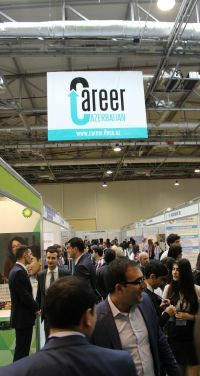 This year, the participants of the Career exhibition, including Azercell, Azersu, Azersun Holding, Formula1 Baku European Grand Prix, Gilan Holding, Baku Metro, Halliburton (US) andSOCAR, SOCAR Polymer companies among many others, will present vacancies in the fields of oil and gas, telecommunications, transportation, finance, water supply, energy, sales and marketing.